We are back again with a brand new update regarding what you can expect this month in the world of Sularia. July is in full swing and as the dog days of summer descend on us, now is a great time to grab a cold drink and read all about Battle for Sularia: The Card Game! The Good, the Bad, and the Savage are still on pre-order until July 20th. At that time we will be shutting down the discounted pre-order price and the exclusive promo cards, which includes an early released play set of Disruption. If you simply don't want to pre-order we understand and The Good, the Bad, and the Savage will be available for general release in November. We will continue to provide development and production updates over the coming months regarding this release. Reign of Terror is progressing along nicely. We are currently receiving the final illustrations, which we will be put into final template cards. At that point, we will run each card through our quality assurance process to look for typos and template issues. We anticipate that Reign of Terror will be sent to the printer by mid-August and will be shipping to us by mid-September. Because of the process, we are using we have reduced our shipping times substantially and are able to deliver this product in early October is very doable. Of course, if we can speed up the timeline up we will and as always we will do our best to avoid any potential setbacks or delays. We are halfway through the first year of the Alpha Program as we laid it out last December. We are looking to make a few changes in how Alpha Program and Omega Program releases going forward. Up to this point we have released Alpha Program packs and promo's on the first Tuesday of every month. Now some of you may already be asking how does this impact the Alpha Edition promo cards. This is a good question, and we have been so very pleased by the response and support for those cards over the last few months. We will be continuing with those cards but they will be released to our web store on the third Tuesday of every month and will be removed when they are replaced by the new card on the following month. These programs are still a learning curve for us here at Punch-It and we want to make sure that the releases make sense and work within our timelines. The Alpha Program and the Omega Program represent a lot of work for us and we need to manage that work as best as possible. Of course, we always listen to our community and your feedback is greatly appreciated on these sorts of items. Please feel free to jump into our Facebook community or sign up on Slack to interact with us and let us know your thoughts on these changes. You can always comment below this post as well. July brings the newest command pack to be released into the Alpha Program. 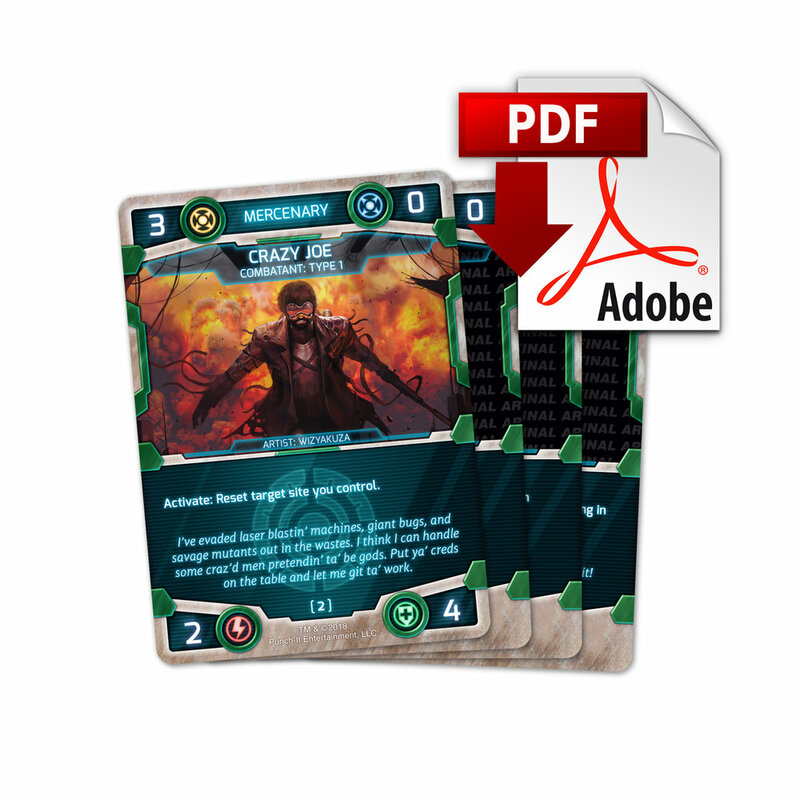 This is the mid-point for the series and with it comes a whole batch of Mercenary cards to add to your deck building arsenal. The Mercenary faction has always had a big impact on Sularia. Lone Wolf is no exception to this. Many factions find themselves in situations where if they had a powerful combat trick they could leverage advantage in an early stage of the game to potentially set their opponents back. Lone Wolf allows each and every faction early game threats to be site killers. This is balanced against the cards scope, which only allows it to be played on an individual combatant who is attacking a site alone. This means that while you send a joint strike force of combatants at another site on an opponents board, you are also only sending one combatant at a second site. It is a risk that you are telegraphing your combat trick to your opponent and they may be able to defend it appropriately. 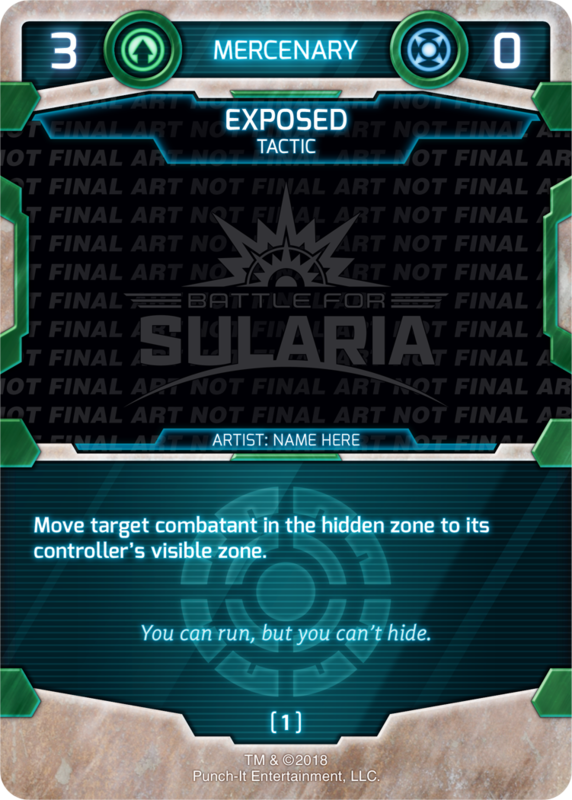 With the Exsularian faction's release on the world of Sularia, there are now two factions who are very good at deploying their threats into the hidden zone. An in some cases those threats may never leave. One of the more powerful Synthien plays is to put Projectus Immunis into the hidden zone and give one of your combatants each round a permanent immunity to damage. Exposed entering the fray helps players when their meta is running rampant with powerful hidden zone plays. Its ability is simple in practice but can have a big impact on how games resolve. Players can use Exposed to pull a Solomon out of hiding or a Spirit Warrior, both significant threats that can have big impacts on the game as it goes on. With skillful play Exposed can even get that projectus out of hiding, and help make sure the threat can be managed. I have already done a write up on Crazy Joe for our Reign of Terror Kickstarter campaign, but I'll spend a moment recapping that here today for those of you that may have missed the article. If you are a fan of the fiction you know that Joe is one heckuva crazy mercenary. He has all the big guns. Joe even set up his shop in the hollowed out husk of a Hekaton Warhulk. He pairs perfectly with Crazy Joe's Explosives to offer the ability to put out and remove two explosive counters, but the depth of his ability doesn't end there. There are many powerful sites in the game that have activate abilities. Joe allows you two activations of those abilities for a major upswing. Sites like Metamorphosis Chamber, Ashfall Plains, and Hive of Cera in the Protoan. In the Exsularian second activations of Stockade can be decimating to a low sularium cost board state. Of course, we all want to live the dream of a second activation of Centropolis on the Synthien side, and even extra activations of Storm Citadel on the Jotune can have big game implications. To us here at Punch-It Joe is the perfectly designed Mercenary card because it has impact and value in all factions at this stage of the game and can potentially get more powerful as the game evolves. Disruption is a card that has a major impact on the game of Sularia. Up until the release of Disruption only one faction had an outlet for defusing condition cards. The Synthien card interference was a monster in the 2017 National format as it put opposing players behind the curve. Defusing an Art of War, or a Master Mining program had very large gameplay impacts. As more and more conditions come out, it becomes important that a threat exists that helps prevent conditions from becoming the safest plays for an opponent. While they should remain safer than other cards on the battlefield such as sites or combatants, they should not be considered surefire guarantees for success in deck builds. Even if a player doesn't run Disruption, deck builders will now have to respect the existence of the card and its impact on gameplay. With the Exsularian currently in pre-order, we only felt it was fitting that they be the feature of this month's promo cards. Solomon "The Pariah" and Zed "The Constable" both see a ton of play in Exsularian decks and we wanted to provide you with two of the factions heavy hitters for their inaugural release. We hope you are all enjoying the summer months and still getting a few games of Sularia in, the back half of this year is loaded with exciting stuff from the full art boosters, to the release of both Reign of Terror and The Good, The Bad, and The Savage. We are releasing more information regarding 2018 Nationals in the coming months and we can't wait to see all of you at it and ready to do battle and claim the prize as the best. Until next time, see you on the battlefield! We're only one week away from Blood, Profit, and Glory's launch on Kickstarter! As a special treat we're going to take a look at one of the set's new characters, K.Y.Z.R. "Omega Experiment"! Mercenaries do what they want. It was that way before the Fracture, and it’s definitely that way now. For some it’s greed, for others it’s power, and for some it’s just for fun! Sularia is one messed up world. While there are at least two opposing factions on Sularia, there will be mercenaries waiting to capitalize on it.